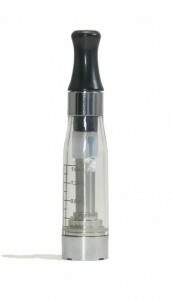 The Vision eGo Clearomizer is one of the most recent variations on the clear cartomizer concept for the electronic cigarette. This cartomizer design does away with the filler material that wraps around the wick in the typical cartomizer. It relies instead on a wick to draw the e-liquid into the center tube where the coil resides. Clear cartomizers make it easy to monitor the level of e-liquid remaining in the cartomizer, significantly reducing the chance of burning it dry. The disadvantage is that many clearomizers have a difficult time wicking enough e-liquid to keep up with the demand from typical ecig use. 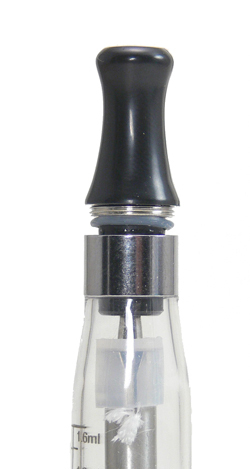 The Vision eGo Clearomizer is no exception on either count. The Vision eGo Clearomizer is one of the best electronic cigarette clearomizer designs we’ve tested. A stainless center tube is encased in a clear outer shell imprinted with fluid level markings. The Vision is available in a wide variety of colors to choose from as well. The wick protrudes from the top of the inner tube and contacts the e-liquid when the unit is tipped horizontally under normal use. Each Vision comes with a mouthpiece that screws into the metal banded top, sealing in the e-liquid and connecting the mouthpiece to the inner tube. 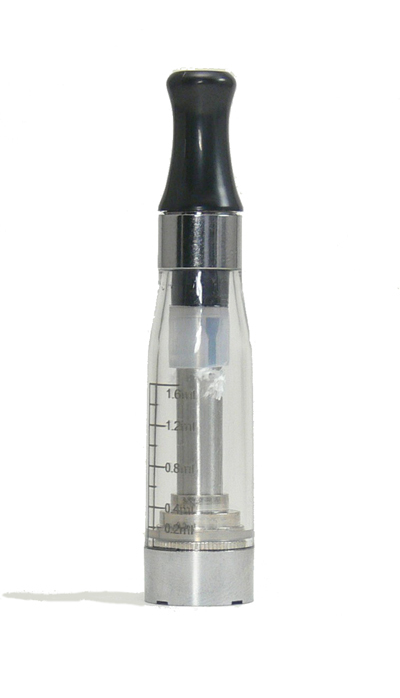 Once the mouthpiece is unscrewed, eliquid can be easily dripped into the outer reservoir without the need for a needle tip. The Vision is made specifically for the eGo style electronic cigarette battery with a trim ring that creates a seamless appearance when attached. It is the inner 510 fitting that screws on, however, making it possible to use the Vision with other advanced personal vaporizers (APVs or mods) with the use of a extension. I recently picked up the 1.8-2.0 ohm version of the Vision eGo Cartomizer from Smoktek and have been quite pleased with its performance. Vapor production and warmth are very good and flavor is excellent. The design makes it very easy to fill and monitor fluid usage. The threaded mouthpiece works flawlessly, not only preventing leakage, but also ensuring that no juice makes its way into the mouth. During a weeks worth of use there has been absolutely no leakage or noticeable diminishing of flavor. Constant vaping can sometimes outpace the ability of the wick to deliver e-liquid, but allowing a few minutes rest resolves the problem. I also noticed that Smoktek is now selling a V2 version with a longer wick which should completely resolve the issue. At $6.49 each, the Vision eGo Clearomizer is a little expensive for a cartomizer and only time will tell if it lasts long enough to make it worth that expense. 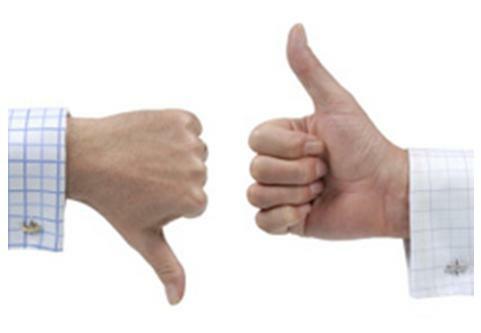 Besides the cost, the Vision would easily be one of my first recommendations for a new electronic cigarette user. The ability to see the level of juice virtually eliminates the uncertainty that many new vapers feel when it comes to adequate filling. And the great flavor production and solid construction also make it a great choice for the experienced user looking for a cartomizer with higher capacity.